You don’t have to take my word for it – look at the birds. The Black-headed Gulls are regaining their black heads. The idiots are also out in force. This prime example spotted the perfect spot to stand and ruin my shot. Then he moved a few feet away before coming back for another go. Robins were singing in the dogwood hedges (Cynical note to self – Robins are always good for attracting likes). And the ducks are looking in fine fettle for breeding. And finally – it’s clear what is on this pigeon’s mind, even if the object of his desire isn’t interested. This entry was posted in Bird Watching, nature and tagged breeding, ducks, gulls, pigeons, robin, spring on February 11, 2019 by quercuscommunity. There are two piers at Lowestoft – the South Pier and the Claremont Pier. The Claremont Pier is, I assume, named after something or someone named Claremont, but none of the published sources seem to mention who it is. Confusingly, the South Pier is, according to my map, north of the Claremont. This called for some heavy-duty lucubration. (Yes, I’ve been reading that website again). Things fell into place with a quick look on Google Maps. The South Pier, though North of the Claremont Pier, is actually South of the North Pier. The North and South Piers are the concrete breakwaters that form the harbour. Like so many words, we expect quite a lot of it and it means at least three things. This becomes clearer when you start to walk along the South Pier, which, in some ways, isn’t a pier – it’s just concrete. There are no legs, no boards and no sight of the sea underfoot. Chris Foote Wood, in Walking Over the Waves, is considers that it isn’t really a pier at all. However, as he points out, the National Piers Society says it is, and they have the final word on the subject. The South Pier is quite good, apart from the puzzling name and the lack of legs and stuff. When you drive up to it, it appears to be quite an elegant Edwardian building situated conveniently close to a large car park. As you park, you notice that the elegant pavilion isn’t part of the pier. It’s actually the East Point Pavilion and, according to the internet is only 25 years old. The South Pier has a traditionally garish front (I speak only for my lifetime – obviously if I was Victorian I’d have a different idea of tradition) with plenty of amusements. It then has a concrete deck, a notice about lobster pots, a lifeboat shop and a trawler that is open to the public. We wondered about the lobster pots, and when we saw someone throwing what looked like a keep net into the water Julia asked him about it. That morning he had caught prawns and shrimps (which I thought were the same thing) and some crabs. He does catch lobsters now and then, which was a surprise as I’d never thought of them being caught off the east coast. He uses bacon as bait. This would work for me too, as I’d be happy to crawl into a net for bacon. From the pier you can see a massive crane on the other side of the dock. This, according to the internet, is based on the North Pier and is doing construction work. Unlike many east coast piers, which had sections removed to stop them being used by the Germans (see previous comments) the South Pier couldn’t be breached, though it was damaged by German bombing. Around 20 bombs fell on the harbour, with one falling next to the pier and one destroying the reading room/pavilion. 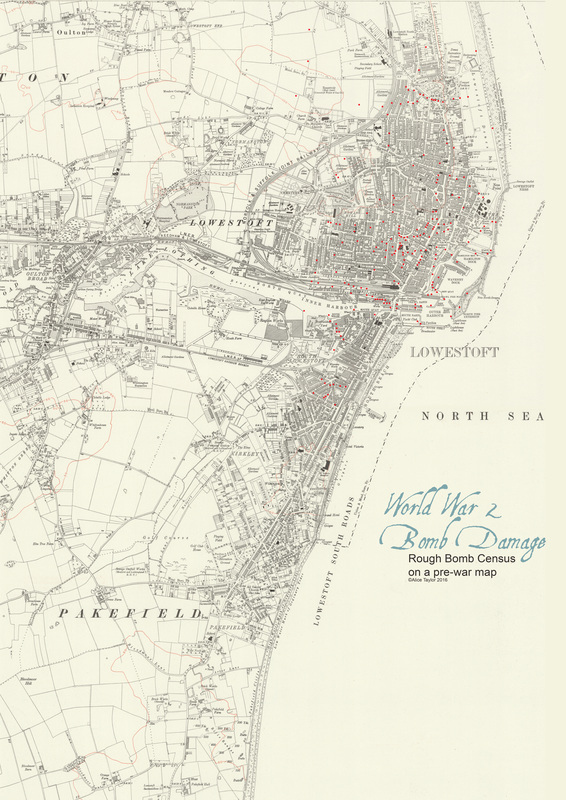 Lowestoft was bombed 90 times during the war and suffered 261 fatalities. It isn’t much compared to the bombing of London or Germany, but it must have been a massive contrast to the holiday season of 1939 when the town was crammed with holidaymakers and the pier was full of happy faces. The South Pier is linked to the Claremont Pier by a road train along the sea front. It’s based on Thomas the Tank Engine, though I suspect that Thomas is considerably faster – we used it and had trouble overtaking pedestrians. A pair of joggers actually overtook us. I was surprised how many people waved at us as we went by. People aren’t normally that pleased to see me. The proprietors of “all you can eat” buffets are particularly not pleased to see me. The Claremont Pier doesn’t have a buffet but it does host a selection of eating outlets, which mainly seemed closed. I suppose you have to do whatever pays the bills but restaurants that only open in the evening don’t really make for a cheery atmosphere during the day. Nor does an empty roller-skating rink, despite the flashing lights. It really isn’t my sort of thing (I last wore roller skates around 50 years ago, fell down a lot and ended up bruised and annoyed) so I didn’t feel inclined to have a go. That just leaves the amusements, and it was a bit hot for getting excited in a confined, badly ventilated, space. The pier’s website shows photos of the eating places and bars, and it does seem to be a much brighter place to be when they are open. If I lived 150 miles closer I’d be seriously tempted by their Sunday Lunch offer, though “beef jus” isn’t really my style. I’m a gravy man. The menu for Scott’s, the restaurant that does fish and chips, looks interesting, and seems to be hammering the local Redpoll population. I notice they do that thing where they miss the £ sign off, as it makes food seem cheaper. Looking at their prices you can see why. Note also that prices are for fish – you have to buy the chips as an extra. I was a bit miffed that the special at Sutton on Sea didn’t include tea. Guess what I think about chips being treated as an extra. As part of a developing theme, the bulk of the pier is merely a seagull playground. It’s a shame, as the walk is often the best bit of the pier. It can be particularly memorable when accompanied by spongy boards and the fear of plummeting through the broken deck into the sea. Let’s face it, when you’re my size this can be a consideration even on a well-maintained pier. This entry was posted in Seaside Piers and tagged definition, fish and chips, fishing, gulls, lobster, pier, prawn, road train, roller skates on July 30, 2018 by quercuscommunity. We saw these beak fencing Gannets at Bempton Cliffs today. It’s part of their mating ritual. He later went fishing and came back with a gift of fish. It seemed to work, as I had to delete the ensuing video rather than become known as an avian pornographer. I reminded Julia that I bought her favourite – smoked mackerel – earlier in the week. According to her answer it seems that gifts of fish don’t have the same significance in the human world. Some of the birds are on the cliffs, but most of the auks (including around a dozen puffins) are content to sit on the sea for the moment. Have to be quick, as I need to post this before midnight. Here are a few other pictures. It was a good day and the telescope came in useful for looking out to sea. Those Puffins were miles away! This entry was posted in Bird Watching, nature, Uncategorized and tagged Bempton Cliffs, Gannets, guillemots, gulls, kittiwakes, puffins, razorbills, rock doves, RSPB on March 10, 2017 by quercuscommunity. I couldn’t get all the pictures into one post, so here are some more from our day at Dearne Valley. The first selection is gulls. Black Headed, Lesser Black Backed and Common Gulls. I don’t know who named them but they have brown heads, grey backs and aren’t that common. The next selection shows Snipe and Gadwall. There are 5 Snipe in the picture with Lapwings but I didn’t see them as I took the picture. That’s good camouflage. Finally, the play area and sculpture. I suspect it is left over from when the council ran it. If you have children to entertain I imagine this would be a good place to bring them. On a Wednesday in term time there were no children, just grumpy old men and married couples. Or, in our case, a grumpy old man who was part of a married couple. This entry was posted in Bird Watching, Uncategorized and tagged Gadwall, gulls, play area, sculpture, Snipe on March 5, 2017 by quercuscommunity. I’m glad to report that the telescope worked well. I’m not so happy with the tripod, but that is a different matter. Eventually it may become the subject of an entire post of its own. When we arrived we noticed a couple of Egyptian Geese, though they pottered off before we unpacked the camera. There were also two Red Crested Pochard lurking round the entrance looking for handouts, which suggests they are escapees from a collection rather than wild birds from Europe. The most memorable part of the day was climbing up to one of the hides using temporary scaffolding and stairs. They flexed a bit too much for my liking, and the experience wasn’t helped by having to carry the tripod. On the plus side, it’s better than having the hide closed. e binoculars, and at the next hide I had great views of a small flock of Goldeneye where the males were starting a bit of courtship, stretching their heads out and swimming round the females. It wasn’t the full courtship, as seen on this clip, but it’s getting there. We finished with a Little Egret. Someone told us that there was a Great White Egret about on the side of the Trent, but this one was the best we could do. It looked like an abandoned plastic carrier bag at first, sitting hunched and immobile by the side of the path. I’d have preferred to see a Great White Egret, but we’ve seen a couple before so it’s not a tragedy. Back at the visitor centre we found there were now five Egyptian Geese, and managed to photograph some, despite the poor light. Meanwhile, looking for a late lunch, we found that they stop cooking at 3.00 pm. I say cooking, but I mean toasting. The choice was therefore a sandwich (just the one) or big pieces of cake, or doughnuts. I’m supposed to be on a diet so we settled for pre-packed bakewell tarts. At £2.25 each they were distinguished more for their profit margin than their culinary excellence. This entry was posted in Bird Watching, Environment, Nottinghamshire, Uncategorized and tagged Attenborough, egrets, Egyptian Geese, Goldeneye, gulls, telescope on February 22, 2017 by quercuscommunity.